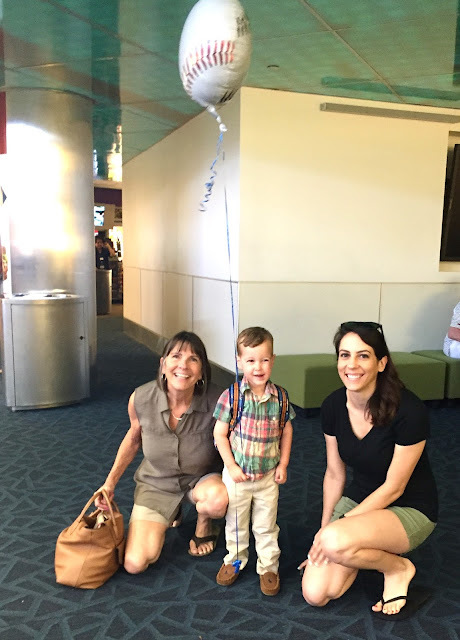 Look how much my frequent little flier has grown! Last week, Parker flew on flights #43 and #44 out to California! He even tried out bringing his backpack for the first time (he packed it with his bunny and some books). I just can't take how darn old he looks wearing it. It's such a different experience flying with him now - instead of a baby that I'm caring for, it's more like flying with a companion! Flying for him is tons of fun - from watching planes take-off and land at the airport, to peeking in the cockpit, to ordering a drink from the flight attendant (something he likes to practice at home, ha!) he loves every minute. 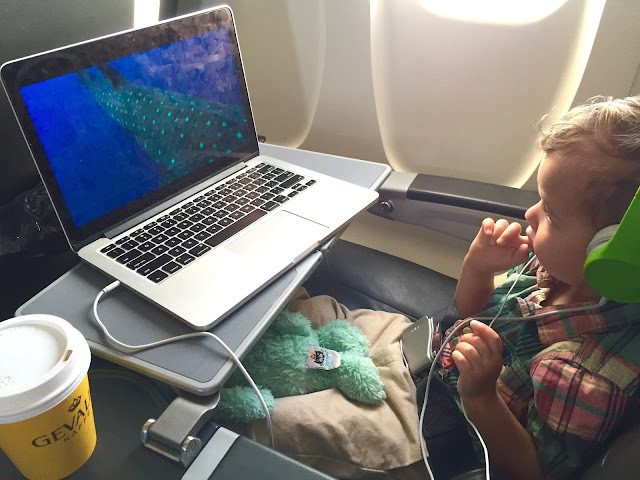 We watched a bit of the BBC's Life on our first flight (a special treat for Sweet P since was are television-less at home and almost completely screen-free with him). 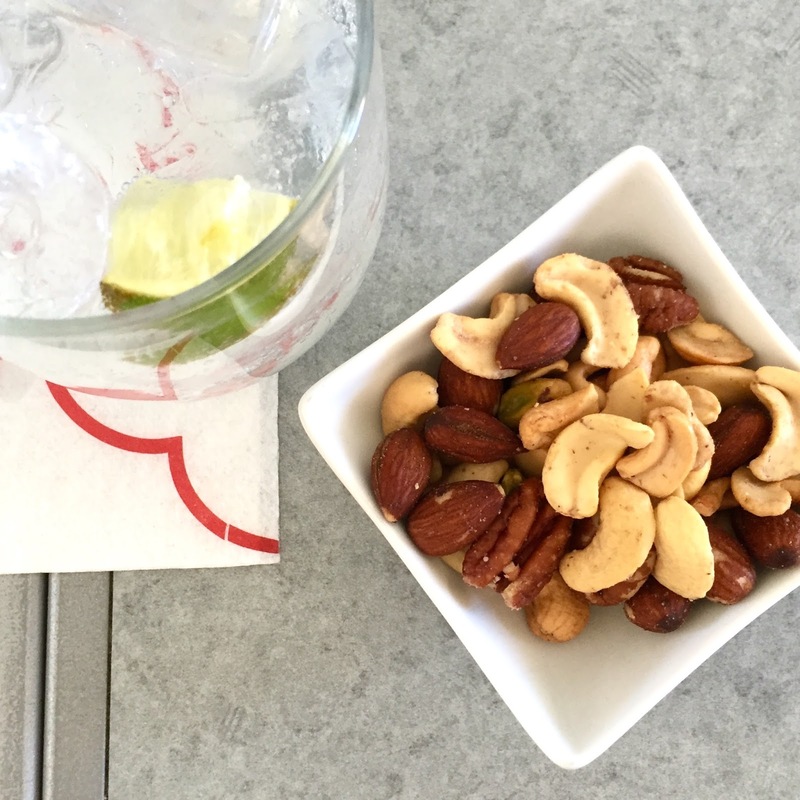 And on our second leg, Parker was officially introduced to the wonders of first class... warm nuts and real glassware - yes, and yes. 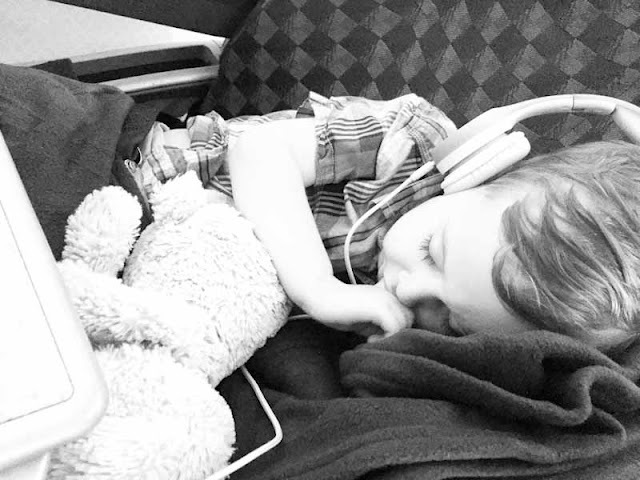 (Though he's flown first class before, he was under age two at the time and flew as a lap child. This was his first real first class seat all to himself.) But seriously, the warm nuts... they deserve their own photo. 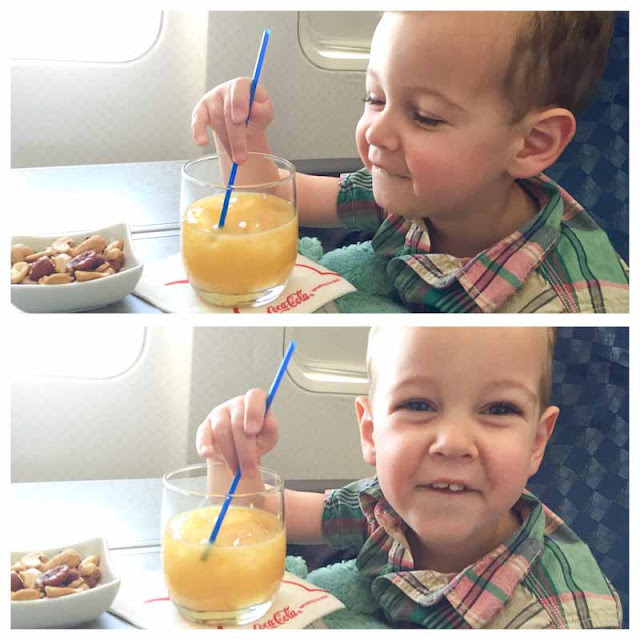 Parker actually noticed the glassware all on his own, tapping his orange juice and excitedly exclaiming "It's glass!" He's totally a little man after my own heart. And my favorite part of first class? The airplane meals! The tiny wrapped silverware... the warm rolls... the airplane wine ;) I'm completely in love with airplane food. I'll take this opportunity to point out that it was during lunch when I could barely reach Parker's plate to cut his food, that I almost laughed out-loud remembering a Parker and Mama flight that took place only a year-and-a-half ago. 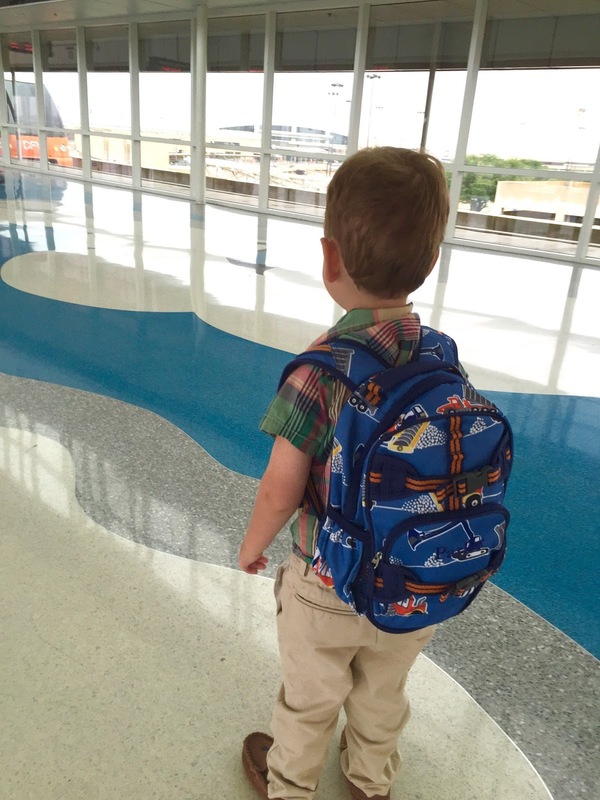 It was a last-minute flight out to Alabama to find a home to purchase (no pressure) before we moved there, and we were routed through Chicago. We had a middle seat and were all sorts of wedged in, Parker was traveling on top of me as a lap child, and y'all I literally started crying when the man in front of us reclined his seat. Right onto my baby, by the way, and completely trapping us in. Did my crying have something to do with the fact P and I had been living alone in Scottsdale for the past six months trying to sell our house while Max was in Alabama, and that we were about to get up and leave our home of five years, our friends and our life to move across the country where we didn't know a soul? Perhaps. But I'm still placing all blame on that man (who, btdubs, was sitting in a spacious exit row and somehow had an empty seat next to him even though the rest of the plane was full... yet he still had to recline... I totally let my 1.5 year-old kick his seat). Anyway, that scenario was running through my head as I had to lunge across our ginormous first class seats to reach Parker on this flight. I wish the crying me could have seen into the future to realize that we did find (and purchase) a house, and one day I'd be laughing at our airplane spaciousness (#thankyouhusby and all the bonus points for flying us first class). P passed out post-lunch while we were viewing our documentary (he thoroughly enjoyed his first class blankets). With him asleep, I opened up my magazine and did some reading. 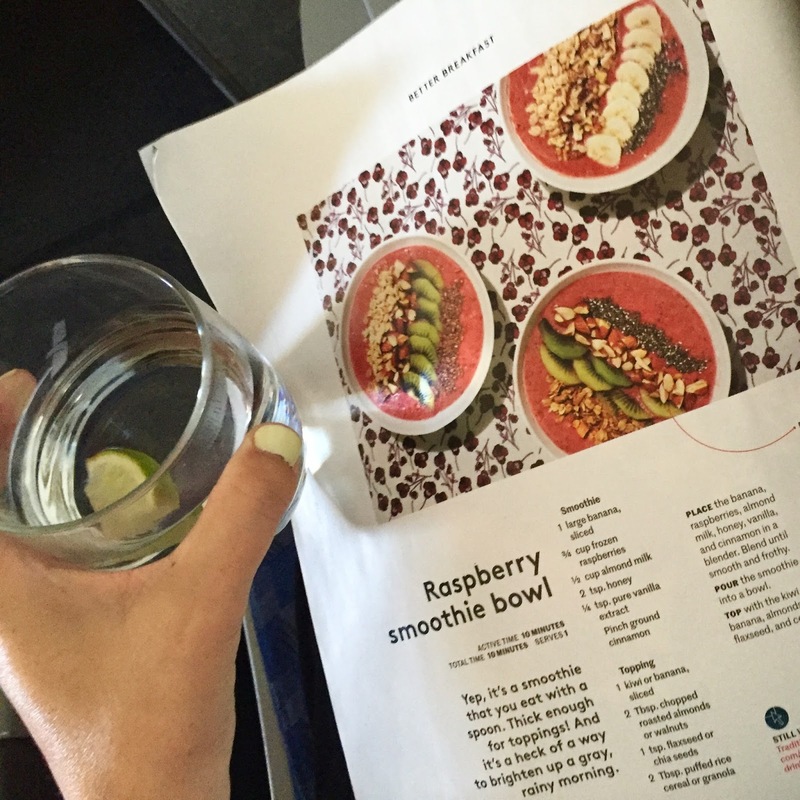 I've already professed my love for smoothie bowls (read here and here) so I was twelve kinds of excited to flip the page in my Real Simple and see that they love them as well! Let the California adventures begin! Enjoy your adventures in California! Good for you! Again, great mommy!!! We say he's developing expensive taste, lol!! What a sweet welcoming committee you had! That flight you had a year and a half ago sounds awful, and I can't believe the man in front of you didn't pick up on what was going on and move his seat back up...Some people are just oblivious. Glad that you were flying in style this time around, and I hope you have a great trip! Flying in style!! First class... too cute! Yes but now he's ruined for all future flights - on the way back he kept saying "First class? First class?" but alas, we were Coach again, ha! Thank you! It seriously went by so fast!